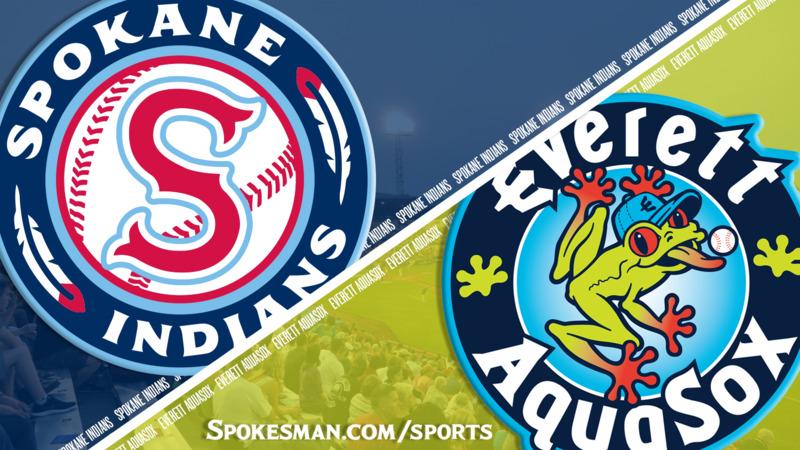 EVERETT – Cal Raleigh and Nick Rodriguez homered in the sixth inning to blow open a close game and the Everett AquaSox hammered the Spokane Indians 11-6 in the first of a three-game Northwest League series at Memorial Stadium on Monday. The Indians (13-12) remained two games behind division-leading Vancouver with 13 games remaining. Five Spokane pitchers issued 11 bases on balls, tying a season-high, and Indians hitters struck out 13 times. Curtis Terry went 2 for 5 with an RBI double and two runs. He leads the NWL with 15 homers and 47 RBIs. The Indians scored three runs in the fourth on three hits and three AquaSox errors. Starter Tai Tiedemann couldn’t take advantage of the lead. He gave up five runs – all in the fourth inning before he was pulled – on three hits and six walks with one strikeout. Spokane rallied for three in the fifth to tie it at 6, as back-to-back doubles by all-star starters Terry and Diosbel Arias both plated runs. But the AquaSox (11-13) jumped on relievers Bobby Eveld and Francisco Villegas for four in the sixth on homers by Cal Raleigh – a solo shot, his sixth – and a three-run homer by Nick Rodriguez, his seventh. New guy: Sherten Apostel, 19, made his Indians debut and went 2 for 2 before leaving the game. He was acquired by the parent club Texas Rangers in the trade deadline deal that sent Keone Kela to the Pittsburgh Pirates. Apostel hit .259/.406/.460 with seven homers and 26 RBIs in 41 games for the Bristol Pirates in the rookie-level Appalachian League. Published: Aug. 20, 2018, 10:16 p.m. Updated: Aug. 20, 2018, 10:38 p.m.